From down the hall, he can hear the shackles being removed from the prisoner’s wrists. Sweat prickles around his suit collar; it was a mad rush downtown, but he got the best seat. He waits. A few more steps, and the accused will enter the courtroom. Then, he’s got 60 seconds to do his job. He is not a character out of a comic book. But Ronn Sutton does have an alter ego. At home in his basement studio, he is the mild-mannered illustrator of a variety of comic strips. But in the courtroom, he is the lightning-fast capturer of the face of crime. 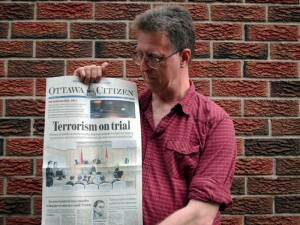 Ronn Sutton began doing courtroom sketches for the Ottawa Citizen about six years ago. 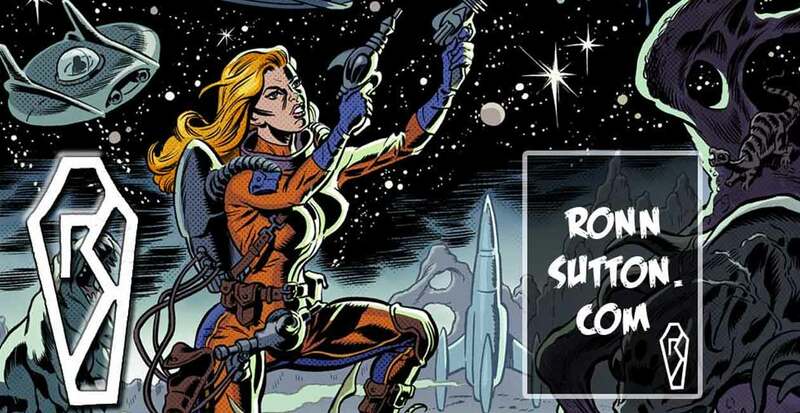 He had been an art director, a designer, and illustrator for many comics including the Elvira, Mistress of the Dark series, until he got a call from the Citizen one evening. The next day, he was drawing at a murder trial. The pace hasn’t slowed; in addition to penciling comics, he was doing one or two courtroom drawings per week. He’s covered a number of high profile cases including several murders, a firebombing, the Mayor Larry O’Brien influence peddling case, and terrorism charges. Usually, the Citizen calls him for arraignments, when the accused first appears in court set a trial date. Photographers are not allowed into the courtroom, so in the 30-60 seconds that the accused stands before the judge, Sutton is the eyes of the public. Sutton, though not super-human, has developed a brain like a camera. “I’m sort of going okay, he reminds me of such-and-such an actor, or he’s got a nose like such-and-such an actor, or his hairline reminds me of my Uncle Bob.” He tries not to look at anyone else until he’s finished the drawing. So he’s fast and deadly accurate. But that’s not the only stressful part of the job. Normally, the court is open to the public. However, at the Khawaja terrorism trial, security was high. “They had police snipers on the roof of the building the first day, there were police walking up and down the hallways with bomb-sniffing dogs, and the police had these huge machine guns,” Sutton said. That’s good advice for some of the convicts he’s drawn. In comic books, there are villains and heroes. But in the courtroom, Sutton doesn’t stylize the people he draws. Comparing an earlier sketch with a recent one, he noted an improvement in the realistic details. He enjoys drawing from real life, and working in colour. Also, it’s widened his audience. The Ottawa Citizen commissions his drawings, but as part of the Postmedia Network, they can appear on stations and newspapers across Canada. There’s nothing he can do with the stack of 70 or so sketches sitting on an armchair in his studio. Someday, he might do an art exhibit. Until then, he’ll keep sketching for Truth, Justice, and the Canadian way.